The firm had a long history before investors could buy its stock. Goldman Sachs (NYSE:GS) has a long history that goes back nearly a century and a half. Yet like many investment firms, Goldman Sachs was originally set up as a partnership. 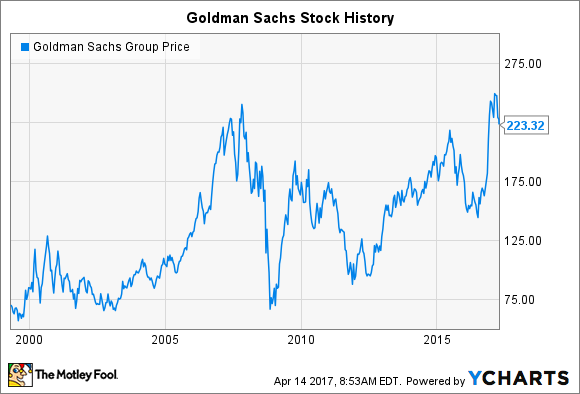 It was only in 1999 that Goldman decided to go public through an initial public offering, selling nearly $4 billion in stock to the public. At the time, the move was the second-largest IPO in history, and it rewarded its partners with huge windfall. Since then, though, Goldman has only gotten stronger, proving its dominance in the investment banking world and weathering storms that destroyed weaker competitors. Now, Goldman is the most influential stock in the Dow Jones Industrials (DJINDICES:^DJI), and investors believe that the future remains bright for the investment giant. Goldman Sachs' stock history looks a lot like you would expect, given the perturbations of the financial industry over the past 20 years. Shares of the investment bank soared after its IPO, riding the wave of enthusiasm about the technology boom and the opportunities to provide investment banking advice to a host of new companies. Yet the bear market from 2000 to 2002 and the 9/11 attacks created uncertainty for Goldman that caused it to lose much of the stock's gains during the early 2000s. The strong economic recovery in the mid-2000s gave Goldman a new chance to thrive, and it seized the opportunity soundly. The housing boom in particular was a high point for Goldman, not only because the good times allowed it to participate in the economic expansion, but also because the company ended up making smart bets about the ensuing housing bust. Despite taking plenty of criticism for its handling of its internal investment positions and potential conflicts of interest among various clients, Goldman nevertheless put itself in a more favorable position than many of its banking peers. In the end, though, Goldman proved vulnerable to the financial crisis, seeing its shares lose about two-thirds of their value between late 2007 and its worst levels in 2008. The investment giant had to seek help from Warren Buffett, who ended up providing $5 billion in badly needed capital to Goldman in exchange for preferred shares and warrants in the bank. Goldman agreed to pay a 10% dividend on the preferred stock, a high price that reflected the scarcity of investment capital during the financial crisis. Yet by 2011, Goldman had repaid Buffett for his investment, buying back its preferred stock at a premium. A couple years later, Goldman settled its warrants with Buffett, giving the Oracle of Omaha a roughly 13 million share stake in the Wall Street giant. Still, it took a long time for investors to share in Goldman's optimism about its recovery. For years, the bank traded at a substantial discount to tangible book value, reflecting skepticism about the valuation of Goldman's assets. Yet Goldman made efforts to bolster its stock price, making significant share repurchases that took advantage of the stock's low valuation. Those moves have paid off by helping to accelerate gains. With the economy moving forward more aggressively, Goldman hopes that its broad-based investment portfolio will thrive. At the same time, rising merger and acquisition activity give the investment bank a chance to boost its service-related revenue, and a more favorable outlook for interest rates could help Goldman increase its profit margin and get a more balanced contribution of sales and profits from all of its banking operations. Goldman Sachs faced the same challenges as other financial giants in surviving the financial crisis and finding a path to recovery. Despite joining its peers in paying billions in settlements related to the housing meltdown, Goldman has largely restored its reputation as an elite Wall Street player, and that should give the company every opportunity to participate in the growth of the industry going forward.